You know that writing a downloadable ebook is the plan for earning huge profits online, but it's you're having trouble getting started. The hardest part of writing is the first sentence. When you look at the whole project, it seems like an impossible task. That's why you have to break it down into manageable tasks. Think of climbing a mountain. You are standing at the foot of it and looking up at its summit vanishing into the clouds. How can you possibly scale such an immense and dangerous mountain? There is only one way to climb a mountain: step by step. 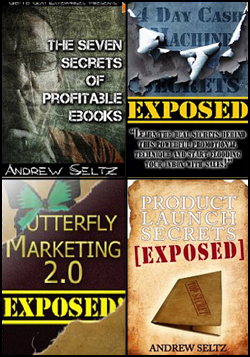 Now think of writing your profitable E-Book in the same light. You must create it step by step, and one day, you will take that last step and find yourself standing on the summit with your head in the clouds. The first thing you have to do, as if you actually were a mountain climber, is to get organized. Instead of climbing gear, however, you must organize your thoughts. There are some steps you should take before you begin. Once you've gone through the following list, you will be ready to actually begin writing your E-Book. First, figure out your E-Book's working title. Jot down a few different titles, and eventually, you'll find that one that will grow on you. Titles help you to focus your writing on your topic; they guide you in anticipating and answering your reader's queries. Many non-fiction books also have subtitles. Aim for clarity in your titles, but cleverness always helps to sell books as long as it's not too cute. Your thesis will keep you focused while you write your E-Book. Remember: all chapters must support your thesis statement. If they don't, they don't belong in your book. For example, your thesis statement could read: We've all experienced insomnia at times in our lives, but there are twenty proven techniques and methods to give you back a good night's sleep. If you can answer yes to these questions, you can feel confident about the profit potential of your E-Book. Next, make a list of the reasons you are writing your E-Book. Do you want to promote your business? Do you want to bring quality traffic to your website? Do you want to enhance your reputation? Then write down your goals in terms of publishing. Do you want to sell it as a product on your website and generate huge profits, or do you want to offer it as a free gift for filling out a survey or for ordering a product? Do you want to use the chapters to create an e-course, or use your E-Book to attract affiliates around the world? The more you know upfront, the easier the actual writing will be. How to make your E-Book "user friendly"
You must figure out how to keep your writing engaging. Often anecdotes, testimonials, little stories, photos, graphs, advice, and tips will keep the reader turning the pages. Sidebars are useful for quick, accessible information, and they break up the density of the page. Write with a casual, conversational tone rather than a formal tone such as textbook diction. Reader's respond to the feeling that you are having a conversation with them. Break up the length and structure of your sentences so you don’t hypnotize your readers into sleep. Sentences that are all the same length and structure tend to be a good aid for insomnia! In an E-Book that is read on the screen, be aware that you must give your reader's eye a break. You can do this by utilizing white space. In art classes, white space is usually referred to as "negative space." Reader's eyes need to rest in the cool white oasis you create on your page. If your page is too dense, your reader will quit out of it as soon as their eyes begin to tear. Finally, decide on an easy-to-read design. Find a font that's easy on the eyes, and stick to that font family. Using dozens of fonts will only tire your readers out before they've gotten past your introduction. Use at least one and a half line spacing, and text large enough to be read easily on the screen, but small enough so that the whole page can be seen on a computer screen. You will have to experiment with this to find the right combination. Last of all: create an index and a bibliography. That's it! You've written a book! Now all you have to do is compile and publish your E-Book online, and wait for download request from your website visitors!